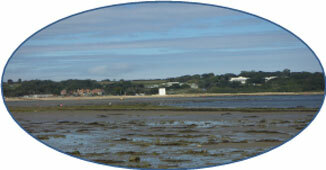 Copyright © Bembridge & St Helens Harbour Association 2011-2014. photography - copyright applies. Information in this paper about proposed developments is based on information presented by Malcolm Thorpe at the BHYC/ BASHHA/ BHUG meeting on 6 May, and on his responses to questions, via notes taken by JS and Mike Samuelson. There may well be differences when the Outline Planning proposal is published by IWC, and obviously better maps/ diagrams, but given the limited time for consultation, I hope these crude visuals by JS will assist. BASHHA committee has decided to oppose the proposals. At our meeting on 15 May we agreed that BASHHA exists to work for the harbour, its environment and community, and consideration of proposals should centre on their likely effect on community and environment, and not on the needs/ aspirations of the harbour owner. In section 3 BASHHA's detailed objections are given. These are exactly as published in Sentinel Special Issue 49A on 20 May. Purpose of development is to raise money to allow the next phase of improvement to harbour facilities, especially the showers & toilets that need upgrading. Also the office mismatch (between the main office & the berthing office). Improvements needed to encourage more customers. Forecast cost of facility enhancements is circa £800,000 which includes anticipated expenditure of the Duver Road. Financing by capital projects was the only option. The building projects would be undertaken in partnership with a building contractor for NHBC guarantee. Other necessary projects include dredging and the possible rebuilding of Bembridge Groyne. A report on silting has been commissioned from Paul Tosswell (Lymington Technical Services) which will be available soon. B: new office and ablution block adjacent to walkway down to the pontoons; southern end housing main office & berthing office; remainder housing new showers & loos (incl. disabled) plus laundry/dry cleaning. Solarpanels on the roof. 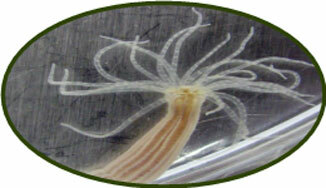 C: new bio-treatment sewage plant for new & existing land and marine use. Limited parking (as now) still available. National Trust said to be willing to allow additional traffic for 5 homes. Emergency access apparently not seen as a problem. All to be connected to mains sewer. All access roads/ paths remain as now. D: [not shown] 68-place barrier-controlled parking next to BHYC car park; loading bays near present BM walkway. MT discussing with Env. Agency possibly re-routing new Embankment Rd seawall around this whole area [incl. existing housing] to rejoin road at lock gates. 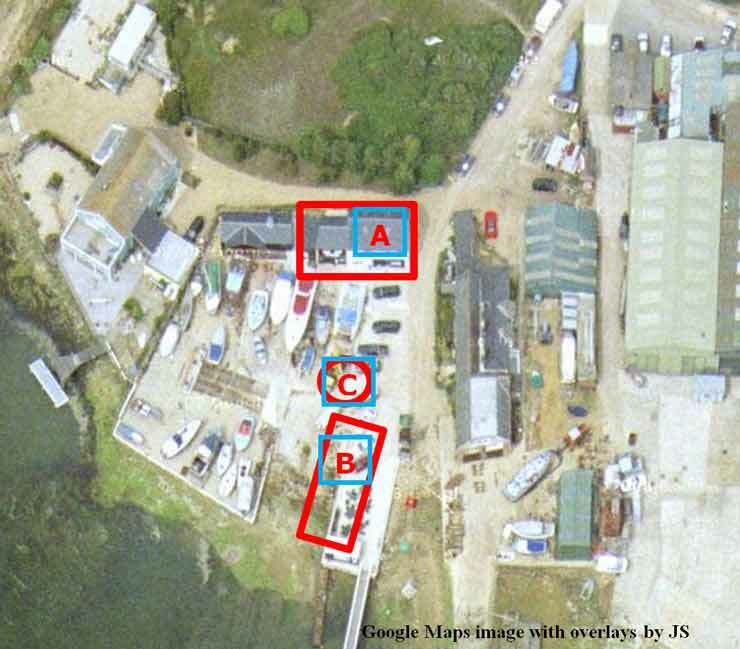 B: 6 small (c. 750sq ft) business startup units on land between houseboat car park and Bembridge Boatyard. a. MT confirmed that the application would be outline. b. In response to concern expressed at the change in the split between residential & commercial buildings, MT reiterated the need for better management and visitor facilities which were unaffordable without money from his proposed developments. However, despite being pushed on a number of occasions MT said that he had no idea how much money these proposals would make. c. No intent to open a shop at Duver Marina; current arrangements with St Helens Post Office for papers would be developed; similarly providing a limited stock of basic commodities at berthing office. MT stressed he did not want to get into competition with local shops. d. Although harbour maintenance (dredging etc) could be funded out of annual income, MT stated that enhancing the facilities as proposed could only be funded by developing existing sites. He also said that he had looked at other options involving Harbour Company properties (e.g. Redwing Quay) but felt his current proposals provided the best options. e. MT confirmed that houseboat car parking was not part of any of the current proposals. f. MT sought to reassure those present that he certainly hoped that the "Islandness" of Bembridge would not be lost. He said that he was proud of all the developments that he had been involved in the past and that he loved the Island and that he had no intention of moving from Yarmouth. 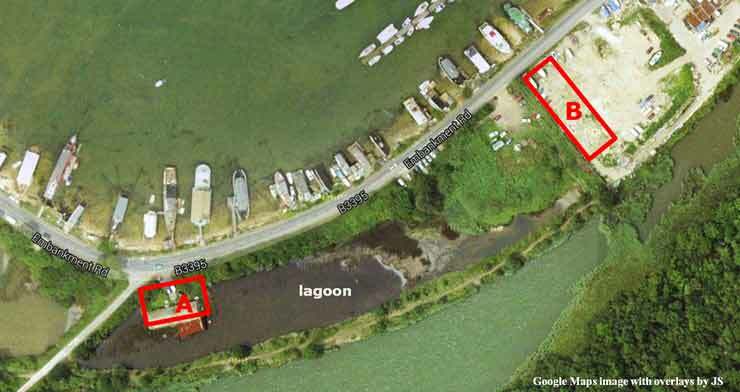 g. MT assured the meeting that there had been substantial investment in Bembridge Boat Storage and that it was not his intention ever to seek to develop the site for residential usage. He added that the property was in private ownership. From the outset of our purchase and as stated publicly at the inaugural public meeting in January 2012, it has been our intention to improve by rebuilding the on-shore facilities together with some small scale development - there has been no hidden agenda at all as has been suggested by some people. As an over-riding statement, the primary business of the Harbour is to provide berthing for boats owned by both local community residents and also visiting yachts; our present on-shore facilities are poor, insufficient, inadequate and substandard in contrast to other harbours and marinas. The Harbour needs to have decent showers and toilet facilities to be provided for all customers. Without such facilities, the income stream from such berthing will be very quickly and seriously diluted along with an equivalent erosion of capital value. We do need to future proof our running costs in providing much better and improved services - such as with a new bio-treatment plant and a more efficient management organisation. As explained, the new Harbour offices and shower/toilet block is an integral part of this element that needs to be completed and in use before the existing offices and toilet block is demolished to make way for the five houses. 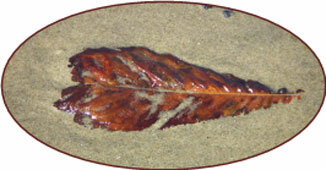 The Harbour's interest and requirements are placed ahead of the property development. Very similar to the above explanation, the new marina floating showers and toilets pontoon is an integral part of this element that needs to be in place and in use before the existing buildings are demolished to make way for the housing development. Again the Harbour's interest and requirements are placed ahead of the property development [as an aside, following my presentation to BASHHA and BHUG at Brading Haven Yacht Club last week, and further consultations with local residents, we have now decided to reduce the height of the three proposed houses fronting Embankment Road by one storey as part of our planning application]. As explained it is the capital receipt from the sale of the Old Boathouse site that will enable the development of the small cluster of business units to go ahead. From our discussions with the IOWC planning department I am prepared to tie both elements together under a Section 106 planning agreement to ensure the business units do get constructed and completed prior to the house. I hope that the practical proposals detailed above provide all the relevant assurances to ensure that the benefits from the development accrue to the Harbour's customers and community. As we have stated all along, both Fiona and I see our Harbour investment as a long term investment and why we do need to put into place the required infrastructure for the business to be built on. 1.6 Allowing the development would set a precedent for further development by adjacent landowners. Agreed: not to oppose ablutions/ sewage treatment proposals, subject to detailed proposals. 2.6 There is no benefit to the community or to local harbour users. 3.1.3 Proposals in conflict with Neighbourhood Plan. 3.2 We are not aware of any demand for industrial units, so no benefit to community and creation/ sale of a housingplot to finance them is unnecessary. 3.3 Allowing the development would set a precedent for further development by adjacent landowners. 3.4 Visual impact in an AONB. 1. The report states that the new sewage treatment plant would not be opposed – unfortunately it is not financially practical to cherry pick an isolated item of capital expenditure out of the entire proposal in such a way. 2. The report states that there are no local or community benefits from the proposal; the purpose of the Harbour is to provide an amenity base for people interested in boating together with berths for annual berth-holders as well as visiting yachts. As additional benefits [and to mention only two], I believe that re-routing the proposed Environmental Agency wall to the north of Port St Helens is a benefit to those house-owners plus the new business units that will hopefully bring marine-orientated business and employment to Bembridge. 3. The site at Bembridge marina is sited in the middle of existing residential housing; the ex-Harbour office becomes vacant in January 2015 and the only interest has been from two restaurant companies to occupy the same. Personally I do not think this use would be a suitable solution. 4. 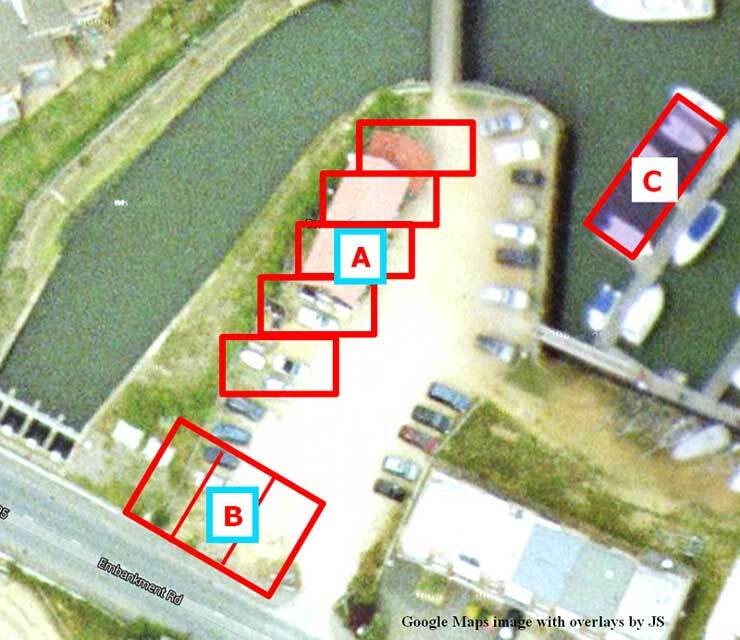 The site known as Selwyn boatyard is to the east of where you have shown on your plan and not on the houseboat car park. [My mistake: have corrected in latest version - JS] This site is designated as part of the Parish Council's commercial designated area in their Neighbourhood plan and hence conforms. 5. To date local interest has been shown in two of the commercial business units and five enquiries have been made regarding the housing - three existing locals, one from Hythe and a further enquiry from the mainland. This is without any marketing at all. 6. Whilst I am not prepared to share sensitive financial data, nevertheless in practical terms, we will continue with our existing investment programme [dredging / new pontoons / buoyage etcc] together hopefully with new on-shore facilities of showers and toilets and offices that need to be built and in place before any new housing can be built. There is a logical progression to our development plans that we can justify to under-write this statement. As an over-riding comment, as we all know there has been a huge lack of investment in the Harbour for many years prior to our involvement; to date since our purchase we have invested in excess of £575,000 in the Harbour's facilities. The next phase to bring forward new shower and toilet facilities with new Harbour offices, plus more berth-holders' car parking that will at last bring the facilities of the Harbour onto a par with the other Solent harbours and marinas and future proof our costs going forwards. Otherwise Bembridge Harbour will remain in the second league of destinations within the Solent with poor facilities and limited cost control. This dialogue is very important from all parties' point of view, and is possibly the first time since before our Harbour purchase that the community has been consulted on the Harbour's future. We certainly welcome the discussion.